It’s a 5.5″ phablet that serves as a mid-range alternative to the Galaxy Note 4. The Galaxy A7 is more than 2mm thinner and a good 35g lighter than its well-known cousin. Other than that it has roughly the same design with a metal unibody – though for all we can see, the back panel does not look as metal convincingly enough. The thing is, it’s not removable but it still flexes a bit under pressure. It also doesn’t feel as cold to the touch as the metal frame around the sides. The unit we have with us is the dual-SIM model (Galaxy A7 Duos) and it has two slots – one is a regular nanoSIM, while the other either holds a second nanoSIM or a microSD (whichever you choose but not both). 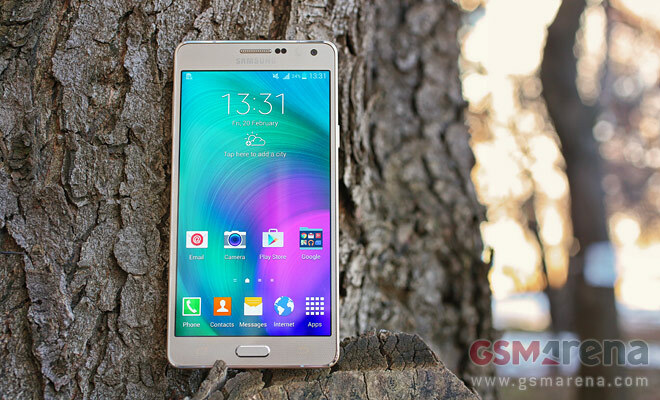 The Samsung Galaxy A7 features a 5.5″ Super AMOLED screen with 1080p resolution. That gives it a pixel density of 401ppi, below the 515ppi of the Galaxy Note 4 though it won’t get many (any?) complaints. There’s no S Pen stylus like on the Notes though. Samsung didn’t make a Neo version of the Galaxy Note 4 so this generation is without a mid-range phablet with an S Pen. Anyway, the version we’re testing, the dual-SIM 3G one, is powered by a Snapdragon 615 chipset (octa-core Cortex-A53). The same goes for the dual-SIM LTE option. The single-SIM LTE phone packs an Exynos 5430 (quad Cortex-A15 plus quad A7), the same chipset as the Galaxy Alpha. The Exynos chipset performed great when we tested it on the Alpha, though with the flexibility of the dual-SIM version the Snapdragon 615 looks like a safe bet too. It’s a 64-bit chipset unlike the Exynos, which will become increasingly important for Android in the future. The Samsung Galaxy A7 is very light (141g) and thin (6.3mm) so it never feels bulky in the hand. The matte back does a great job of hiding fingerprints and is smoothly rounded near the edges so it feels even thinner. It is not a small phone, yet it comes with the same features for one-handed use that the Galaxy Note 4 has. The camera sticks out the back though and not by a little. It’s a 13MP camera that records 1080p video and is flanked by a solitary LED flash and loudspeaker. The front-facing camera shoots 5MP selfie photos and 1080p videos. The selfie camera has a wide-angle lens too, 106°, so you can get several of your friends and take a groupie. The Wide selfie mode helps make selfeis even wider with a panorama-like shooting. The retail box comes with the usual accessories – a one-piece headset, a SIM ejector tool, a microUSB cable and a charger. The charger puts out 1.55A, which isn’t enough for Qualcomm’s Quick Charge and there’s no mention of it in the specs either. The Samsung Galaxy A7 will soon join its A5 and A3 siblings in our review section, stay tuned as we toil on the full length article.